Dear Readers, we are presenting Daily Current Affairs for All Exams- 17th September 2016. 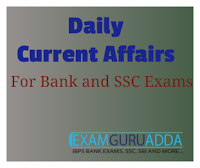 Daily Current Affairs for All Exams- 17th September 2016. 1. India and Nepal signed three MoUs and agreements to enhance the bilateral agreement between the two nations. 2. The agreements were inked during the four-day-visit (from 15 September to 18 September 2016) of Nepal Prime Minister Pushpa Kamal Dahal Prachanda to India. 1. Nadia Murad Basee Taha, who survived trafficking at the hands of Islamic State of Iraq and the Levant (ISIL), was appointed the United Nations Office on Drugs and Crime (UNODC) Goodwill Ambassador for the Dignity of Survivors of Human Trafficking. 2. The appointment marks the first time a survivor of atrocities is bestowed with this distinction. The induction ceremony took place in the United Nations Trusteeship Council Chamber in the New York United Nations Headquarters. 3. During her Ambassadorship, Murad will focus on advocacy initiatives and raise awareness around the plight of the countless victims of trafficking in persons, especially refugees, women and girls. 1. Sports Minister Vijay Goel conferred Arjuna Awards on cricketers Rohit Sharma and Ajinkya Rahane at a function in New Delhi. Sharma was given the award for 2015 and Rahane for 2016. 2. Earlier, the two cricketers could not receive the awards from the President Pranab Mukherjee as they were participating in international tournaments. 3. The Arjuna Awards, instituted in 1961, are given to sportspersons for consistently outstanding performance for four years preceding the year of award and who have also shown qualities of leadership, sportsmanship and a sense of discipline. The awardees are given a statuette, a certificate, ceremonial dress and award money of 5 lakh rupees. 1. Punjab National Bank has roped in Indian test skipper Virat Kohli as brand ambassador to improve its image which has taken a hit due to rising bad loans. 2. On the occasion Kohli said ‘PNB is Mera Apna Bank’ as he has been an account holder of the bank since the age of 16 years. 3. For the first quarter ended June, the bank’s profit declined by a 58 per cent to ₹306 crore on account of mounting bad loans.